Charles Fraser was the son of Sir James John Fraser who had commanded the 7th Hussars from 1826 to 1833 and who had shown great bravery in the Peninsular War, and fought at Waterloo. Whilst the 7th Hussars were in India during the Mutiny, they fought at Nawabgunge on 11th June where Major Charles Fraser was wounded. On 31st Dec 1858 the 7th caught up with some rebels at the Raptee River but three men of the regiment were trapped on an island in the middle of the river and were in danger of being swept away as none of them could swim. Fraser, although still disabled from his wound swam to them and saved them. This was done with great difficulty and whilst under fire from the other bank. He was gazetted for the award of the VC on 8th Nov 1860. Charles Crauford Fraser was born on 31st Aug 1829 and joined the 7th Hussars as a cornet on 3rd Dec 1847. He was a brevet major at the time of his brave deed but was a full major in July 1859. 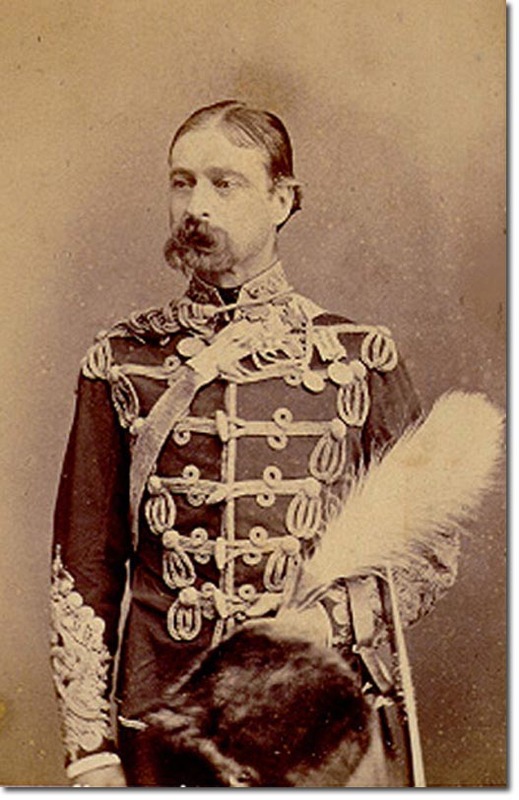 He exchanged to the 11th Hussars on 16th Aug 1859 and was promoted to Lieutenant-Colonel on 18th Jan 1861. The photo shows him in the uniform of a full Colonel of the 11th Hussars, with his VC medal just below his collar. He commanded the 11th from 1861 to 1873, during which time he was promoted to brevet colonel (18th Jan 1866). He served in the Abyssinian Campaign of 1867, and acted as ADC to the Duke of Cambridge from 1873 to 1877. He was appointed Inspector General of Cavalry in Ireland 1880-84 and was Colonel of the 8th Hussars in 1886 until his death. He reached the rank of Lieutenant-General and was made a KCB in 1891. He was MP for North Lambeth 1885-92. He died in Sloane Street on 7th June 1895.